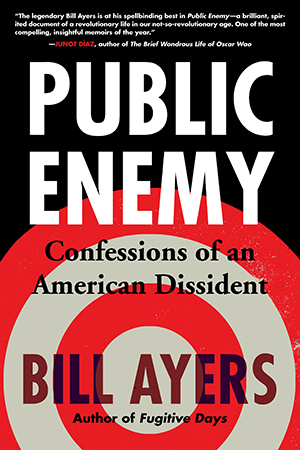 Labeled a “domestic terrorist” by the McCain campaign in 2008 and used by the radical right in an attempt to castigate Obama for “pallin’ around with terrorists,” Bill Ayers is in fact a dedicated teacher, father, and social justice advocate with a sharp memory and even sharper wit. Public Enemy tells his story from the moment he and his wife, Bernardine Dohrn, emerged from years on the run and rebuilt their lives as public figures, often celebrated for their community work and much hated by the radical right. In the face of defamation by conservative media, including a multimillion-dollar campaign aimed solely at demonizing Ayers, and in spite of frequent death threats, Bill and Bernardine stay true to their core beliefs in the power of protest, demonstration, and deep commitment. Ayers reveals how he has navigated the challenges and triumphs of this public life with steadfastness and a dash of good humor—from the red carpet at the Oscars, to prison vigils and airports (where he is often detained and where he finally “confesses” that he did write Dreams from My Father), and ultimately on the ground at Grant Park in 2008 and again in 2012.